Q: I thought Styrofoam for construction was blue or pink, is this white Styrofoam okay for use in buildings? A: “Styrofoam” is the trade name owned by Dow for the blue or pink board, product that is made from styrene and gasses that foam and expand it. Its technical name is XPS – Extruded Polystyrene. Our product is EPS – Expanded Polystyrene. EPS is made from styrene as well but uses only heat and steam in the manufacturing process. Both products are used heavily all types of construction. Q: How do we keep rodents away? A: By using proper exterior finishes, trims, and sealing as you would in traditional construction. The EPS used in our foundation systems has no nutritional or food value and will not attract rodents. Also, it’s solid monolithic core deters rodents interest by providing no immediate cavities of interest or access. Q: Is this foundation sound proof? A: Not fully sound proof, but certainly it is as sound proof as other construction. All walls have different sound characteristics. SIC systems are generally equivalent to traditional wood wall construction assemblies for sound transmission, they are not noticeably worse or better overall. Q: We feel concrete is a much stronger foundation, how is this safe? A: Concrete is rigid, heavy, and has a high resistance to compression and still needs steel chosen by engineers for balanced strength. The SIC systems use steel that is also chosen by engineers to meet the loads a building will need to endure. Simply put, our system is designed with the required strength but without heavy concrete. Q: Does the styrofoam in your foundation wall system off gas? A: No. Our product – EPS – does not off gas, it is totally inert and has no chemical fumes or other emissions that would affect the air quality within your home. Q: What happens if we have a flood? A: Like any flood situation there would be damage done to and repairs required for all water affected materials like drywall, wood sheeting, and finishes. However, the EPS & galvanized steel in our system is generally unaffected and needs only to be drained and dried before new sheeting and finishes are applied. Q: Can we use this foundation system if we are purchasing a RTM / prefab home? A: Absolutely. SIC foundations are well suited and easily designed to meet the needs for any RTM / prefab or modular home. Standard crane lifting or block-beam and roll methods to place the home on our foundation are all accommodated. Q: We already have our blue prints done for our dream home, can we still use your system? A: Yes. SIC foundations are designed to match your house plans. Though there may be some adjustments to match our thinner wall thicknesses, added space to your basement within the same exterior wall dimensions is a good thing. We use your plans for our system, it’s a direct changeover that will not affect your dream. Q: We have been researching energy efficient homes, would this product be a good fit? A: Yes. Our standard SIC systems exceed current energy codes, and our no bridging design eliminates almost every point of heat or efficiency loss. We can customize our systems to higher thicknesses and R-Value to meet all requirements including Net Zero, Passive-House, and off the grid designs. Q: We are in a rural area and concerned with construction waste, how do we deal with all the construction waste from the system? A: Easily, because the system has minimal to almost no waste that needs to be dealt with. It is supplied fully precut, to your design, for assembly only construction on the jobsite. Any waste that may be created is plastic or steel, both materials that are readily recycled or inertly disposed of. Q: What kind of exterior finishes do we have to use? A: Your choice – any finish used in traditional construction. We supply waterproof membrane with our foundation walls for below grade exterior wall surfaces. Above grade, you can use parging, stucco, siding, cladding, sheeting, virtually any finish. Q: Do you know anyone that lives in a styrofoam foundation house like this? A: Yes, I know over 1000 families that do. The original Polycore brand was started in 2003, and since that time 1200 projects have been completed. As a founder of the brand, I myself have lived in a house I built with it since 2008. Q: How do we get permits for the system? A: Permitting is the same, or perhaps easier, as with other builds. As the SIC system is Engineered, we supply stamped drawings needed for the permit process that are used in applications, plus inspection and verification letters when needed. Q: Do we have to hire expensive professions to install this foundation? A: No. Regular trades, regular contractors, do-it yourself builders or handyman builders are all easily capable of installing SIC systems. While any whole house build is a complicated procedure that will benefit from professional builders, SIC systems are on their own built with simple, easily trainable, and easily guided procedures. Q: Do you have a crew you send to our site to install all this for us? A: No, but we do send advisors. Our area coverage and wide variety of buyers and builders benefits from focus on local or owner based installers. The simplicity of the install procedure is best explained by ‘on-site’ advisors training builders with a hands-on process taking only a few hours at your jobsite. Q: We have a very small infill lot not a lot of site working room, how do you think this would work for us? A: It would work very well. Though the actual sections are bulky, they are scheduled to arrive on site as needed. Panels are handled easily without large equipment and a full foundation can be installed, capped, and backfilled in as little as 4-5 days to free up site room in short order. Q: We just purchased a home with a wood basement that needs to be replaced, would your system work for this application? A: Certainly. Replacing a foundation is a big project, often made more difficult by the need to work quickly, in small spaces, and adverse site conditions. The SIC foundation has advantages in its building process that address these needs, and will provide a more efficient end product to extend the life of your home. Q: We do not want a full 8′ foundation, could we use your system for a crawl space? A: Yes. Many such projects are already installed with our system. We manufacture to your design needs, and that includes crawl spaces. Q: So how do I hang the drywall on this kind of foundation wall? A: Same process as any house, just a different screw for the steel studs. Your drywall crew will spend equal or less time installing as they would for a wooden frost wall and certainly less than that of a bulging insulated concrete form wall. Q: What do I need to do to get drawings and engineering done to use this system? A: Simply tell us to start. SIC system drawings and engineering are usually included in our project prices. We do of course need information from you for that process, but we take care of the details to provide you a complete solution. Q: How long do I have to wait? I want to have this home built by Christmas. A: Our foundations need 8 weeks on a typical timeline, as 2-4 weeks for design and engineering then 3-4 weeks to manufacture and deliver. By the time a concrete or an ICF foundation is installed, cured, and backfilled our system is capped, backfilled, and insulated! Q: Does the SIC foundation have a Warranty or Guarantee? A: Yes. SIC has a 10-year warranty on the materials and products. Plus, the design of our system includes stamped engineered drawings, a lifetime structural warranty from the Engineer. Note that like most products, these coverages are dependent on and set in motion by inspections done during your build. Q: What is the life expectancy of this kind of foundation? A: We design for a 100-year house. Both EPS and galvanized steel that make most of the system are materials with historically proven long lifetimes. An understanding of these properties, and our goal of designing to optimize for longevity, gives you a building envelope that will last for your life and future generations. A: EPS and steel studs in our system have no nutritional value, they do not support or benefit the growth of mold in any situation. Our design also eliminates all thermal bridging to reduce or stop any moisture and condensation issues which are one of the root causes of mold in buildings. Q: What is the cost difference between a regular concrete foundation and this foundation? A: You will save money with our foundation. SIC foundations save time, shorten schedules, and require less staff or equipment than traditional methods. Plus, the superior insulation provides more savings every day you live in the building. Q: Do you have a manual we can have to review this product? A: Yes. Though dated and often general rather than specific, we do have manuals for past system versions that will provide an understanding of the tasks required. Our printed manual program lapsed when we began providing install advisors for each project as a more effective and accurate training program. We are working on new manuals and videos that will be available through the website as they are made. Q: How many years has this product been around? A: It was first started as “Polycore” in 2003, by two partners one of whom is the current owner of SI Construction Systems Ltd. Though there have been some name and partner changes, the product has been used on over 1200 projects. Q: We would really like a walk out foundation can you provide this? A: Yes, we can. In fact, our walkout design is faster, better, and easier. There is no grade beam required for the walkout wall, a stepped footing allows the SIC wall to be run down to the footing in order to provide a faster install and insulation all the way to the footing for a more energy efficient design. Q: What about deep back fills? A: Yes. Backfills to the levels in residential construction are easily done with the SIC system. Our engineering specifies the structural needs for deep backfills to ensure the product meets the needs of your specific home design. Q: What about different height of footings/ stepped footings? A: The SIC system can easily match footing steps and changes that may be required for your design, and it still comes pre-cut to meet these footing changes. In fact it can also be modified where required to meet unexpected footing changes. Q: Do I need to use rebar in the footings? A: Yes. The size and spacing of the rebar is defined by our engineers and placed to match the structural needs of your building. Q: My electrician said that is very difficult to wire a house using steel studs. A: This can be true with other systems, but SICS has precut electrical channels that make wiring easier. A horizontal chase runs through all wall studs and each stud is already punched with grommets inserted to meet code. Vertical wire channels are in almost every panel, allowing electric drops and rises as needed. Q: How is Styrofoam a green, earth friendly product? A: That’s a big question. EPS is not technically Styrofoam (see FAQ#1), but it is the same material and both have a bad rap. EPS is 100% recyclable, has low input of energy/resources when manufactured, has high energy savings for low cost, has no gasses or toxins to pollute soil or air. For the long answer, see my blog. Q: Why are you not using this for all the interior walls as well? A: Simply put, it’s not needed there. A key feature of our system is insulation value, and interior walls do not need insulation. Wood or steel framing can be used for interior walls at less cost and they meet all the needs for those areas. Q: Explain how to buck the windows, and frame doors? A: Certainly. 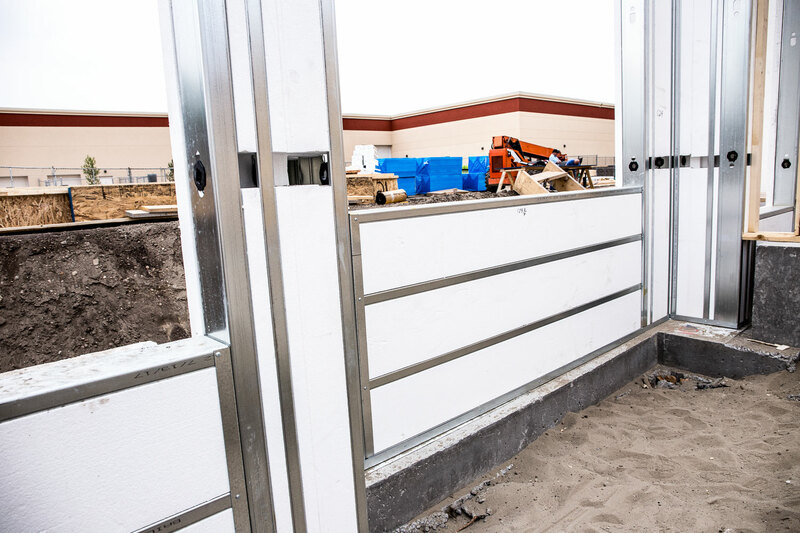 Our system has structural steel studs on all four sides of all openings. Wood studs (bucks) are screwed to that steel to frame the opening out in order to provide wood for window sealing, mounting, trims, and finishing. Q: Many of your construction photos show lots of bracing, is this really necessary? A: During construction the SIC foundation walls are light weight, fully exposed, and only partially attached. Like any sheeted wall, sufficient bracing is needed to hold the system against any winds or weather your site and location could have. Q: With all this insulation value, would this product work well for building a temperature controlled wine cellar? A: Yes. It can make a stand alone room in an existing house similar to a commercial walk-in cooler, or be included into the wall design build of your new home. Q: Why aren’t all the builders using this? A: Because its different. Many aspects of new home construction have not changed in decades or longer, and those that have were forced by new regulations or codes to make buildings better. The bigger the builder the more adverse to change. Our system is becoming more prevalent with smaller (1to 5 houses per year) builders as new energy codes are coming into the industry, but change is a slow process. Q: I want custom height walls, could we have say 9′ or 10′ walls rather than the standard 8′? A: Yes. Tall foundations, walkouts, raised ceilings and dropped upper floors all need special wall heights as well. We design the proper structure to for the wall height you need or want.